The Hybrid Pro Custom Modular Kit 08 is an ideal stylish modular display solution for the serious exhibitor. The modular Kit 08 display frame is heavy-duty and durable and has LED display lighting illuminates the backwall for increased visibility. With available features like push-fit graphics, shelving, tables, monitor mounts, storage areas, and much more. The Hybrid Pro Modular series is a cut above the rest when it comes to quality. Make yourself stand out at your next event with the Hybrid Pro series backwall. Backwall Counter: 25.5"W x 39.2"H x 15.1"D approx. 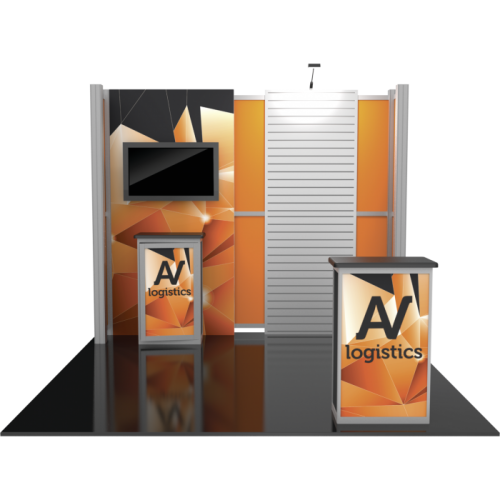 Exhibit Booth Display Hybrid Pro 10ft Modular Room Kit 04The Hybrid Pro custom trade show booth has ..